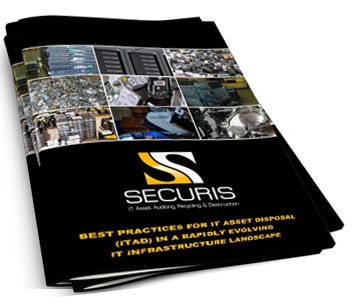 Securis has invested in the development of a meticulous and secure end-to-end process that brings together technology, people, processes and infrastructure to ensure the highest levels of quality throughout the entire chain of custody of our clients’ IT assets and electronics. All electronics are inventoried by serial number or, in the event that there is no serial number barcode, units are tagged with a proprietary Securis asset tag for easy identification and tracking. All electronic data is rendered irretrievable by Securis’ trained staff, using data destruction methods that are in complete compliance with NSA and DOD standards, HIPAA, FACTA, Gramm-Leach-Bliley and various other state and federal compliance measures. Additional security protocols, such as degaussing, can be executed, based upon each client’s approved data destruction plan. Corporate identifying information is removed from all electronics. Materials are shredded using one of Securis’ industrial electronic media shredders. Securis clients are presented with an inventory list and Certificate of Data Destruction, signed by a Securis officer, upon job completion. This Certificate is a nationally recognized legal document of performance and can be used for an organization’s auditing and reporting needs. All employees undergo extensive background checks, are U.S. citizens, must accept and sign a non-disclosure, confidentiality agreement and participate in ongoing training on security procedures. Securis’ facilities are subject to constant intrusion monitoring and protection to insure the security of each client’s electronic assets and information. Every Securis vehicle is equipped with the latest in GPS tracking technology and intrusion protection reinforcement.